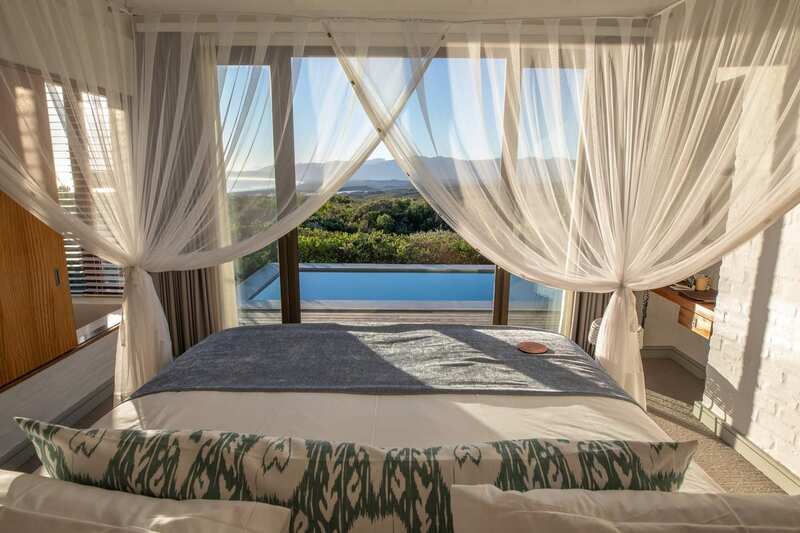 A luxury eco-reserve tucked between mountains, forest and sea, Grootbos is a one-of-a-kind experience | Eat. Play. Drink. Cape Town. LAST month was World Pinot Noir Day – who knew? Not even Peter Finlayson from Bouchard Finlayson, a farm in the Hemel-en-Aarde valley which produces award-winning Pinot Noirs. Even so, Finlayson rose magnificently to the occasion by inviting a small group of us to join him for a pairing dinner at Grootbos Private Nature Reserve just outside Gansbaai, about half an hour from Hermanus. While the 2016 Galpin Peak Pinot Noir – which has been raking in the local and international awards – was to be celebrated, we also got to taste some other Bouchard Finlayson great vintages with a spectacular meal prepared by chef Ben Conradie, served in the private candlelit wine cellar. Grootbos is an incredible experience from beginning to end, and I was lucky this was my second visit. Upon arrival you’re greeted by your own personal hosts who will look after you throughout your stay – from checking you in and showing you to your private lodge suite, to guiding you on the various excursions and activities available to guests. The main building of the Forest Lodge is where you’ll find the restaurant, infinity pool, bar and lounges, a conference centre and an arts and crafts shop. Once you’ve been warmly welcomed, you’ll be taken to your suite, along the winding pathways through the forest. 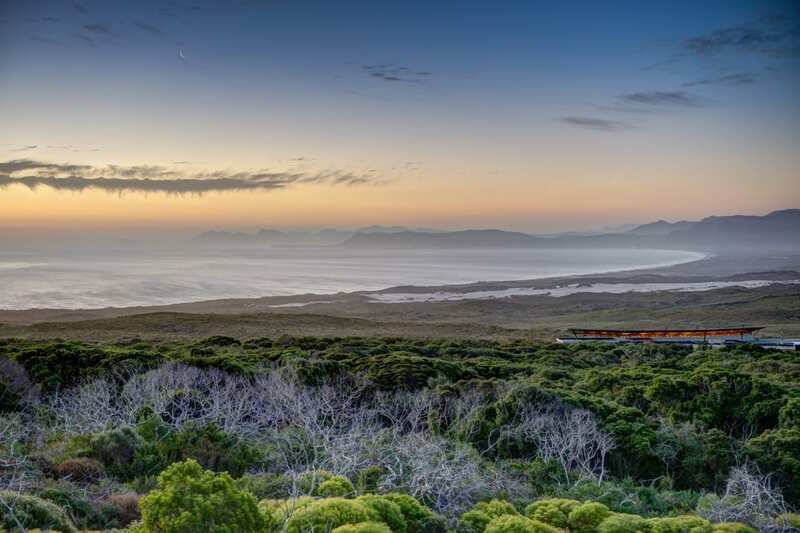 There are 16 individual houses in this part of the reserve, all offering exquisite views across hectares of fynbos and all the way to the ocean. Comprising a lounge, bedroom, en suite bathroom, second bathroom, kitchenette with the complimentary mini bar, and a large deck with outside shower and sun loungers, chances are you’ll never want to leave. A Forest Lodge suite is by no means slumming it; they are utterly gorgeous and you don’t even need to see another soul the entire time you are there (until you get hungry, that is). Big sliding doors open the lounge and bedroom out onto the deck, and you can leave them that way day and night to allow communion with Nature. 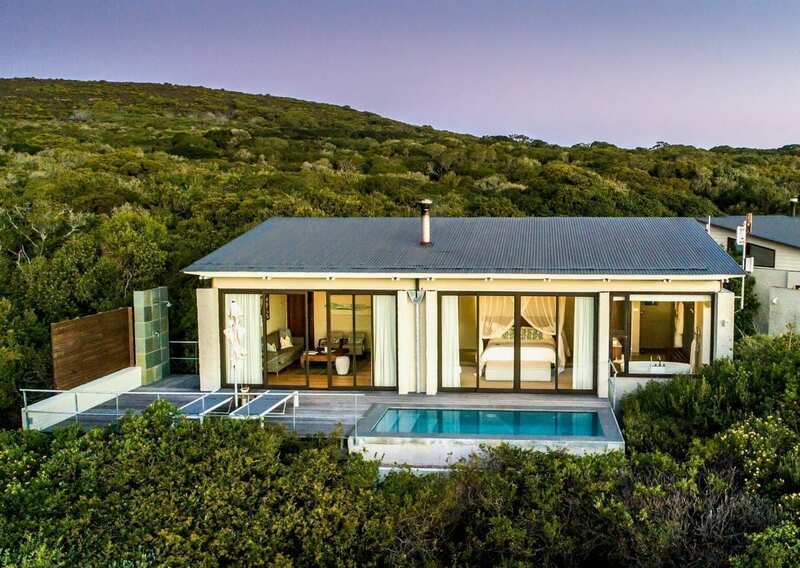 That gets a capital letter because it’s very much an important part of Grootbos, which includes a fynbos kingdom and ancient milkwood forest which are home to – are you ready for this? – 800 plant species, 118 bird species, 29 mammals and 21 amphibians – some of which are under threat of extinction. Having the doors open is an invitation to the creatures of the outside – I was joined by a friendly little gecko that was completely unfazed by a giant human. Four poster beds festooned with gauzy mosquito nets ensure a peaceful night’s sleep. Anyone who has been affected by water restrictions will relish the fact there is underground water so a deep bath is an extra special treat. Worth a mention are the fabulous robes; so much so I decided to stay in one instead of getting up for breakfast. The reserve is not only an uber luxurious retreat but significantly involved in conservation and community upliftment through various programmes and initiatives. Carefully curated experiences offer guests the chance to grow, learn and discover, whether it’s spotting the Southern Right whales and their calves that visit Walker Bay from July to December, learning how bees pollinate flowers, or meeting passionate people changing the world. 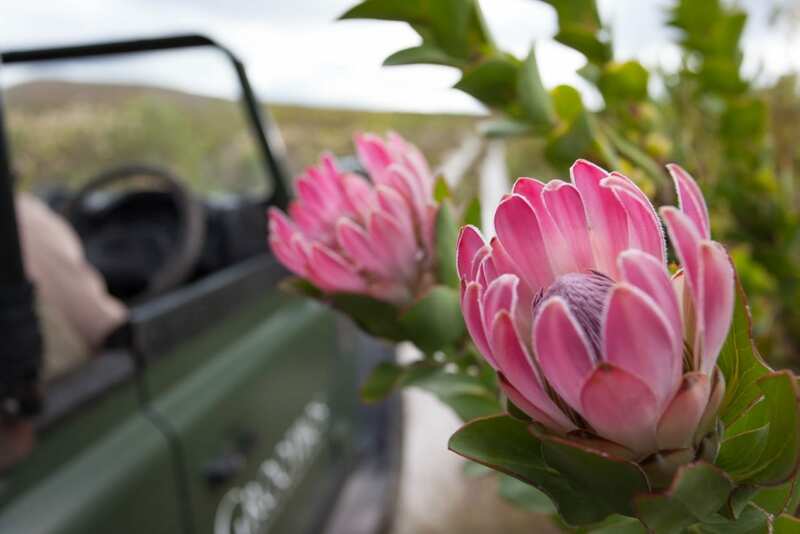 During the course of my time spent at Grootbos I have been taken on journeys of fynbos exploration and education – on horseback and in 4×4 vehicle, walked through the 1000-year-old milkwood forest in search of fairies and elves, and visited the ancient Klipgat caves at De Kelders. These are reached via a significant number of stairs and over some rocky terrain, but the effort is well worth the result. Your personal guide will also explain the fascinating history of the caves. This was followed by a walk along the wild beach to a rocky outcrop where we toasted the sunset with bubbly and canapes. This is only a small taste of what you can enjoy as part of you Grootbos experience. If you can dream it, you can do it.